Starbucks (NASDAQ: SBUX) is scheduled to report its first quarter (three months ended December 2018) for Fiscal Year 2019 earnings on January 24, 2019 after the markets close. The company is expected to post revenue in the vicinity of $6.49 billion, which is 6.8% growth year on year (YOY). Earnings are expected to be in the range of $0.60 to $0.70 which would be similar to the earnings posted in Quarter 1 of Fiscal year 2018. The company is expected to be boosted by the ever-expanding reach in China, increase in Delivery Sales, new Product launches, and the deal with Nestlé which will include Starbucks in its At-Home coffee portfolio. We have a $66 price estimate for Starbucks, which is in line with the current market price. The charts have been made using our new, interactive platform. 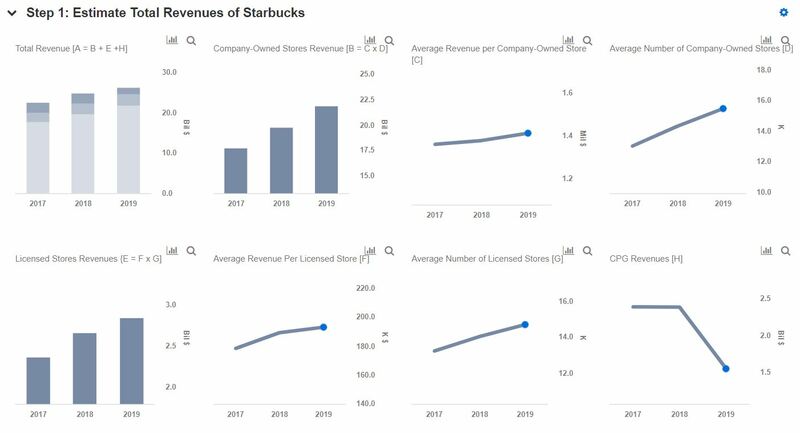 You can click here for our interactive dashboard on Our Outlook For Starbucks In 2019 to modify different drivers, and see their impact on the EPS and price estimate for Starbucks. Growth in China: China continues to remain a long-term growth driver for the company, as its GDP, projected to exceed $15 trillion by 2021 from $11 trillion in 2014, is expected to fuel a massive increase in its middle class. The company plans to open a net 600 new stores in China in Fiscal 2019 (1100 net in Asia-Pacific). This would be more than one-fourth of the Total net new stores globally, which reinforces the point that the company is taking the China market quite seriously. The partnership with Alibaba is expected to boost the delivery sales and give a perfectly unique experience to the customers. Cold Beverage Innovation: The company drives innovation through its stores to meet consumer preferences. The company has seen the proven highly incremental results from Draft Nitro Cold Brew. Based on this success, the company announced in its last investor conference that it plans to roll out Nitro to all U.S. company-operated stores by the end of FY19 to meet customer demand for this growing platform. Starbucks Delivers: Starbucks is working with Ele.me (as part of its partnership with Alibaba), China’s leading on-demand food delivery platform with 3 million registered delivery riders, to give its customers the best delivery experience possible. The company has started two ‘Star Kitchens’ within two FRESHIPPO supermarkets in Shanghai and Hangzhou. This makes Starbucks the first retail brand to establish a dedicated back of house presence in FRESHIPPO locations to utilize its distinct fulfillment and delivery capabilities to further reach and better serve customers. The company has also announced a partnership with Uber Eats as a pilot project in Miami and Tokyo and said it plans to expand Starbucks Delivers to nearly a quarter of its U.S. company-operated stores in early 2019. Global Coffee Alliance: Starbucks with Nestlé are moving fast to develop the company’s At-Home coffee portfolio. Starbucks announced that both companies have developed a range of Starbucks-branded products for the Nespresso and Dolce Gusto platforms and Roast & Ground and Whole Bean coffees. The launch of these products in traditional CPG and Foodservice channels will take place beginning in the spring of this year. Digital Initiatives: Starbucks’ partnership with Alibaba (since August 2018) is also a collaboration across key businesses within the Alibaba ecosystem, including Ele.me, Hema, Tmall, Taobao, and Alipay. With this the company aims to enable an even more seamless Starbucks digital experience and transform the coffee industry in China. Under this partnership Starbucks will launch its first ever virtual Starbucks store in China. This store provides customers a one touch digital Starbucks Experience, utilizing the Starbucks app and Alibaba’s customer-facing mobile apps, including Taobao, Tmall, and Alipay. This digital innovation is expected to revolutionize the traditional offline-to-online model as it will effectively extend the reach of the Starbucks Experience into the everyday lifestyle of Chinese customers.